Do you have a new truck? It’s not gonna protect itself! It’s up to you to find the best truck accessories to keep your ride protected and sharp at all times, and LINE-X is here to help. As the world’s undisputed leader in spray-in bedliners, LINE-X products add an impervious barrier to any part of your 4×4. Or your tractor. Or your motorcycle. Or your boat. Heck, LINE-X protective coatings can safeguard that styrofoam cooler you bought at the gas station if you want. But we digress. 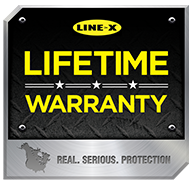 The point is that your truck needs the unparalleled protection of LINE-X, from its front grill to its back bumper. Here at Alpine Truck Accessories, we’re the experts to give you the guidance you need in addition to our quality 4×4 parts. With more than a dozen years of experience, meticulously applying the planet’s most sought-after protectants and installing its equally amazing accessories, we are Williston’s premier LINE-X dealer. Be sure to browse our truck shop for the best off-road parts in the industry!